Unregulated hunting and loss of habitat nearly caused Turkeys to disappear from Texas. Jason Hardin, Turkey Program Leader at TPW, says thanks to hunter and landowner support, bag limits and a restocking program, they’re making a comeback. 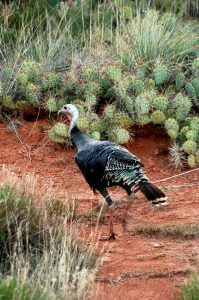 In Texas, we’ve been working hard since the 1930s and 40s to put turkeys back on the landscape in Texas. We’ve been tremendously successful with the Rio Grande—500 to 600-thousand birds in the state today. But with the Eastern sub-species, we haven’t been as successful. Nevertheless, TPW and its partners continued eastern turkey restoration efforts in the state. In 1979, we brought our first eastern wild turkeys over from Louisiana—put them in Tyler County—they did pretty good. In 1987, we worked with the National Wild Turkey Federation, their Making Tracks program. We started working with lots of states, bringing turkeys into east Texas. Using what we referred to at the time, using a block stocking approach. That involved releasing 15 – 20 birds at five to 10 locations in a county; they’d work in that county for two years, and then move to the next. During the latter part of that block stocking era—mid-nineties, Dr. Raul Lopez was doing some research, and he found that we were doing two things that he thought we could improve on: we could put larger number of birds on the ground—increase that up to 70 or 80 [birds]; he referred to it as super stocking. The second area for improvement was the habitat into which they released the birds. More on that tomorrow. You are currently browsing the Passport to Texas weblog archives for the day Tuesday, April 16th, 2019.